How to avail GST Input Credit in states where business is not registered? As per the provisions of the GST Act, a registered person is required to get himself registered in the state from where outward supply is made. However, a person registered under a state may avail the services from other states where he is not registered. And there may also be the cases where the services are consumed in the state where he is not registered like, accommodation in hotels. The above two factors determine the nature and type of the tax to be charged on the supply. Further, from the Input Tax credit point, a person registered under one state is not eligible to take the credit of other state where the Place of supply is not in the state where he is registered. A registered person is eligible to take ITC of the Inward supplies in cases where the Place of Supply falls within the state in which he is registered. And if he has availed services on which the Place of Supply is another state, ITC is not available to the said registered person. XYZ Ltd. suppose has a registration in Haryana and they avail accommodation services of a hotel in Udaipur (Rajasthan). Now if the accommodation charges are Rs. 45,000, the “CGST+ SGST” of Rajasthan would be 9% each of Rs. 4050 each. The services are consumed in the Rajasthan itself and XYZ ltd being registered in Haryana is not eligible to take the ITC of the CGST & SGST of Rajasthan. The Hotel is required to charge CGST & SGST only, he simply cannot charge IGST on services provided to XYZ Ltd registered in Haryana. Now, the same will be the cost for the XYZ ltd. There would be no issue to the XYZ Ltd if the frequency of such service is less. However, if it was a case where a huge amount of ITC becomes a cost to XYZ Ltd and frequency of such services are higher, then in that scenario, XYZ Ltd may voluntarily takes the registration in that state where such ITC is blocked. Merely taking registration is not the solution, XYZ ltd is required to provide Outward Supply from that state in order to take the benefit of such ITC. Further, a registered person engaged in providing services can take the registration in different states in order to avail the benefit of ITC. It is pertinent to note that a argument may be made that if ITC is not taken then the same may be claimed as an expense under the Income Tax in the year in which such expense incurred. But the important part is that the benefit of taking ITC is available immediately on availing the services and it can be used immediately for paying the output tax liability which results in lesser cash outflow of the registered person. So, it is better to take registration in order to solve cashflow issues too with the minimal compliance. But If you want to avail the blocked Input Tax Credit, you can take GST Registration of that state, and avail Input tax credit on all purchases and expenses done in that state by the business. To avail GST Registration in that state, a business must have an office address to register for GST as a proof of address of that state. If you already have an office space in that state, you can easily register on that address, but if you don’t, then you will have to own/rent a, office space. This is where Virtual Office for GST Registration Plan can help you in getting cost effective solution for just INR 1000/month, which provides solution in professional business centres & Coworking Spaces. The documents provided for GST Registration are Owner NOC, Rent Agreement, and Electricity Bill. To begin with the discussion let’s clear that there are no businesses that are required to mandatorily register in another state for GST except one i.e. in case of OIDAR, which we will discuss later in this topic. As per the provisions of section 22 of the CGST Act, every supplier shall be required to registered in the state from where it makes taxable supplies of goods or services or both if his aggregate turnover in a financial year exceeds twenty lakh rupees. So, the requirement for registration arises from the provisions of section 22 of the act, which says if any taxable supplies of goods or services is made from a state then registration is required in that state only. Why GST registration is required? such other person or class of persons as may be notified by the Government on the recommendations of the Council. The above are the cases where registration is mandatorily required under GST irrespective of the fact that whether aggregate turnover exceeds 20 lakhs or not. From the above facts, generally, registration requirement arises in the state from where Outward supplies are made and not in the state where supplies (INWARD SUPPLIES) are received. Further, the need to take registration is based upon the fact that “from where supply is made”, we can say that the “place of business” or “location of supplier” is the place from where a business is carried out. A Real Estate company having its Corporate office in Delhi only and their business is to provide the Buildings on Rent / Lease. The company has buildings in 10 different states other than Delhi. Now the Question is whether he is required to registered in all the 10 states and the Delhi State or only registration in Delhi state where the company has its corporate office is located will serve the purpose legally and lawfully. Now if we interpret the provision of section 22 of the CGST Act, a person is required to registered in the state from where he supplies taxable goods or services or both. And to understand the registration requirement in case of the above example, we need to understand that from where the company is providing taxable supplies of Services of Rent / Lease. The Place of business as defined above includes a place from where a business is carried out and location of supplier includes a place of fixed establishment in cases where registration is not taken in a particular state. These types of cases are creating problems in the Industry also, as the compliance level of the tax payers is increased in these situations. One should have to consider the above definitions and understanding to determine the registration requirement under GST. Further, there are some specific situations where businesses do face problem while availing ITC i.e. INPUT TAX CREDIT on Inward supplies. To elaborate further, let’s take an example where a company is registered in Delhi only. Now the employee of the company visits in Maharashtra and stays in a hotel there. The GST charged by the supplier (i.e. the Hotel) is CGST + SGST of Maharashtra. Now, if the company wants to avail the ITC of the part which is not available due to the provisions of the ITC rules, the company is required to take the registration in Maharashtra. However, if the company does not have ay taxable supplies in Maharashtra, then taking the registration is not the solution for the blocked ITC. The same problem can be solved by taking registration as an Input Service Distributor. However, the law does not mandate to take registration to save that blocked ITC, it totally depends up on business to business. This is where Virtual Office for GST Registration Plan can help you in getting cost effective solution for just INR 1000/month, which provides solution in professional business centres & Co-working Spaces. Virtual Office for GST Registration In Mumbai: Virtual office Space in Mumbai. If you are looking for an office space for your Business Registration/GST Registration, but do not want to bear the hefty costs of a rented office or shared office space. Then a Virtual Office Address offers you the benefits of a professional office address in professional business centres and coworking spaces, with all the required office amenities. All your couriers and parcels will be received duly at the office address. Also, all the compliances and physical verifications required as per the various government departments, will be duly complied and taken care of. InstaSpaces provides you professional virtual office spaces with a business address at a prime location in Mumbai city. Prices start as low as INR 800/month. Goods and Services Tax(GST) introduced on 1st July 2017 and it’s an indirect tax on the supply of goods & services taken by the Government of India to fulfilled the development of the Nation. GST is a consumption-based single nation tax on the supply of products and services. it’s a location/destination based tax. GST has subsumed taxes like Central Excise Law, Entry Tax, Service law, VAT etc. GST is one among the largest taxation reforms within the country. GST is implemented to gather all state economies and improve the overall economic growth of India. It is not compulsory that for GST registration needs your own office space with the rental agreement but this is not true. Reality is you can use a SHARED SPACES” like a Virtual office in any business center or coworking space, for GST Registration anywhere in India. 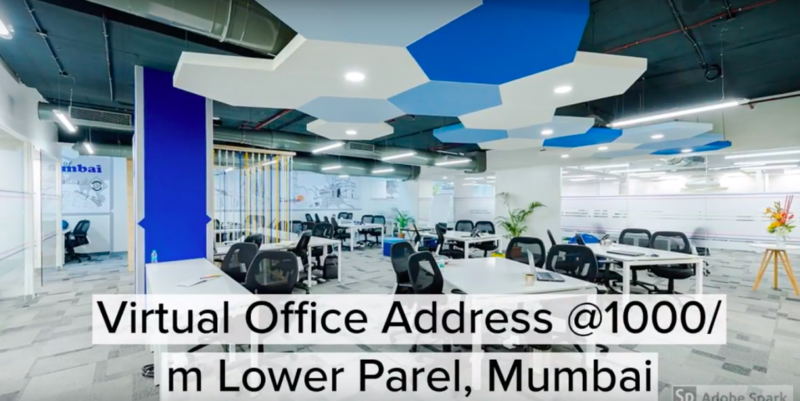 Now there is no need to rent out a physical space for GST registration in Mumbai, You can use a virtual office for GST registration at a prime location in professional co-working. Don’t worry if you don’t have one, InstaSpaces has a solution for this, It can be a good solution where you can kickstart your business. It can provide real value and freedom to choose your own office. Book Virtual office space in Mumbai to get address of a premium location in reputed professional business centers. You will be provided with a top location in Mumbai city for your startup and multinational alike, with address in prime business district areas of the city. Note: Courier receiving service is included in all the above plans. We will be collecting all your couriers & documents at your virtual office address, and notifying you over email. You can use this premium address on your business cards, letterheads and all other company correspondence. InstaSpaces provides your the professional business address. Any Customer check your office location will be able to find that you are based in a commercial or business area in Mumbai city. If a customer wants to cross check your business address, they can do so from MCA portal or from GST Portal, and will get the confirmation of the address. You can also use this address in all the invoices, as every GST invoice now needs to have the company registered address mentioned on every invoice. This professional address adds to your company image, and gives confidence to the clients to process your payments and to work with you. Virtual Office Space For Business Registration in Mumbai- Register your company anywhere in Mumbai, without a physical address with a Virtual Office Address. You will be provided with complete documentation, prime location address & all in-office services. You can also check step by step process to book virtual office for business registration. Virtual Office Address For GST Registration- If you have need for GST Register number anywhere for Mumbai, with the help of Virtual Office. With a virtual office address you will be able to register for GST for that location. Moreover you will be provided with all necessary documentations like NOC, Agreement, Signage, Electricity Bill. Virtual Office Space For Mailing Address- If you need a Prime Office Address for the purpose of courier handling then virtual office in the solution for you. With the help of virtual office you can get a address for mailing purpose at prime business centres anywhere in India. 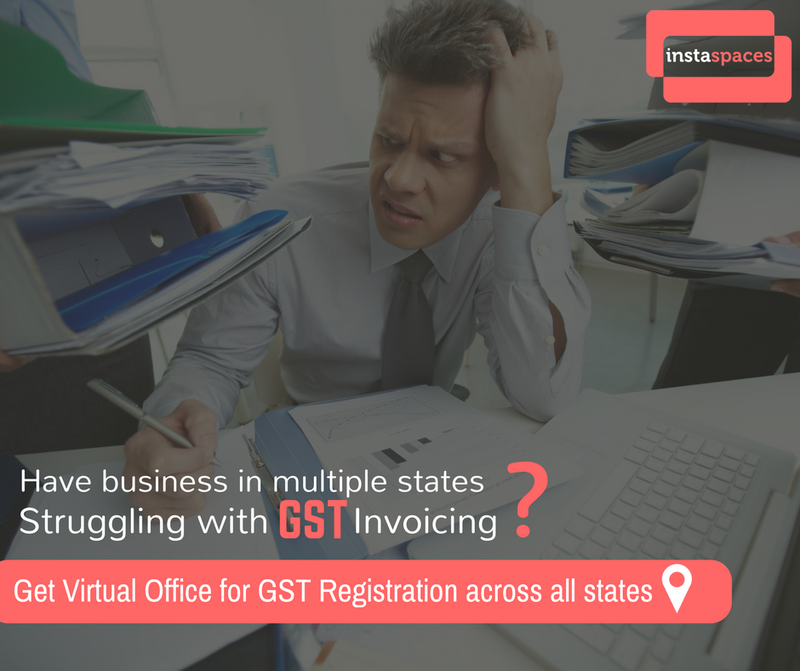 Mumbai Virtual Office for GST Registration on Demand – InstaSpaces virtual office for GST Registration provided on demand in Mumbai city. InstaSpaces provided a virtual office address and related services, you can also avail office space as needed in Mumbai city. If you have need office spaces on demand in Mumbai city Choose from flexible co-working space and pay for use of facilities by the hour or day, or rent serviced offices that come with the full range of InstaSpaces facilities and services. Virtual office address with GST number explore the business and help to maintain the IGST from CGST and SGST. When you take virtual office address with GST registration then no problem in invoices. Mainly virtual office is taken by E commerce re-sellers, travel agents, real estate brokers, chartered accountants, etc. They all are take virtual office only for GST registration. E commerce sellers take the virtual office address of the warehouses in Mumbai with the GST number. You can check benefits of virtual office for E-commerce sellers. For Corporate India, GST will remove the cascading effect of tax. As a result of which, double taxations will reduce as the Centre and State are working in tandem. In short, we will see crucial step towards reforming the indirect tax system in India. Another benefit is the intra-state business will be cheaper. The tax burden on logistics will reduce and become seamless as companies will have to pay a uniform tax in all states across the country. GST paves the way for India becoming a national market. For international players, this uniform tax structure on indirect tax will help in ease of doing business. The implementation of GST will also streamline the unorganized players as all stakeholders who have already paid taxes will compliance proofs to claim their set-offs. This will bring in transparency in the system. If you are looking for office address for GST Registration in the state of Gujarat, this post will help you with getting the most cost-effective virtual office for this purpose. Firstly, let’s get clarity on GST Registration and why it’s required, and then about virtual office concept, and then finally how you can avail the virtual office solution. How does the GST (Goods & Service Taxes) System work? GST (Goods & Services Tax) is a single tax-rate which is applied throughout the country. GST merges the many central taxes like service tax, sales tax, excise duty tax, etc. with the state-level tax like luxury tax, entry tax, entertainment tax, etc. and collects as a single tax. 25 percent rate applied on a rough industrial diamond. 5 percent rate applied to packaged food items and footwear under Rs. 500; and apparel below Rs. 1000. 12 percent tax rate applied to apparel over Rs. 1000, sugar, cutlery, frozen meats, etc. 18 percent tax rate applied to luxury items like cosmetics, swimming pool, footwear costing more than Rs. 500, etc. 28 percent taxing goods rate applies to cars, motorcycles, ceramic tiles, Indian cigarettes, etc. Note The books, foods, newspapers, hotel services, and homespun cotton cloth under Rs. 1000 have zero (0%) percent tax rates. A virtual office provides a business with a physical office address and office-related services, without the incurring huge costs of an extended lease and maintaining an office for the team member & staff. These addresses are provided in professional business centers and coworking spaces, in prime locations. Virtual Offices can be further used for a business’ registrations with various government authorities and other organizations. One can apply for GST registration, open current accounts with banks, apply for trade license or register the business with statutory government bodies with virtual office. With a virtual office, your team members can work from any place, however still utilize a mailing address, phone answering and messaging services, meeting rooms, and a lot more other services provided at these virtual offices at a lower price and with larger flexibility. Further, you can use this Virtual office address as your business’ address for your Business Cards, Website, letterheads etc. All couriers or mails can be received for your business at this address. Who needs to register for GST (Goods & Service Taxes)? Every business needs to register for the GST number as the Indian Government has made it mandatory to have a GST Registration. GST number in each state is required by every business which is making an inter-state supply of goods and services. Also, it is mandatory for e-commerce businesses and for agents/traders. Further, any person who makes supply on behalf of other registered taxable persons, carrying out a taxable supply of goods or services in India and whose turnover exceeds the threshold limit of Rs. 20 lakhs per year will be required to register for the GST. Allows to easily register on the e-commerce websites or platforms or under their fulfillment plans. NOC (No Objection Certificate) by the owner.